If you are considering going to the Riu in Aruba...DON'T. My family checked in the day after Christmas and was there for 14 nights. Upon check-in we asked the front desk if their concierge could confirm some reservations we had made prior to our arrival for restaurants outside the hotel. We were told they have no concierge. What hotel in this day and age has no concierge? I've stayed in 4 other Aruba hotels and they all do...No help from them there. Then we asked the housekeeper to please get us some additional hangers and tipped her $20. She never came back with hangers, but of course took the money. The above is trivial though compared to the following: Our suite was beachside on the 2nd floor. On Dec 30th my sister was on our balcony on her laptop. She left the door open and propped it open with a chair and the laptop was placed on the inside of the doorway. She ran to use the bathroom (no more than 60 seconds). While she was gone her laptop was stolen. Someone reached inside the room and stole it. A little boy identified the thief as he saw him climbing the external stairs. The thief then ran with the computer THROUGH the hotel. The hotel that you aren't supposed to enter without a wristband. He pushed and knocked down the 5'0" 110 pound security guard. This guard called for backup, but guess what? He's the only guy on duty. So you'd think the hotel would call the police, right? NO. We had to do it ourselves from our cell phone. We filled out a report. Immediately after, the hotel Public Relations manager came to talk to us (never the on duty manager or GM). She identified the thief from the video of him going through the casino as a man named Rolando. She claimed her friend dated him. She failed to mention which we found out from other staff that he was a former employee of the hotel who has been robbing the rooms on the beachside for the last 12 weeks. The hotel did not add any additional security fully knowing this man would come back. 2 nights later after dinner at around 1am my sister was on the balcony on the cell phone with her boyfriend when she looked down and at the foot of the stairs to our room was the man fitting the exact description of the thief staring up at her (black man, thin, over 6 feet tall, long dreadlocked hair, traditional Jamaican beanie style hat in black, black messenger bag). She screamed and ran inside and he ran away. My whole family ran outside and saw him running and got a pretty good side view of him. The police came again and filed a police report for us just so it was on record. About a week later my sister and I were reading a book and watching tv in our suite's living room and we heard a noise on our terrace at 1am. In the room is a big picture window covered with venetian blinds. However, on top about 8 feet off the ground is an uncovered half moon window to let a little light in. We both froze and for some reason we looked up to see the outline of this man standing on the table on our terrace with his face up against the half moon window peering in. It was the same man. He saw us and jumped down and ran as we screamed. When we went outside we noticed many of our neighbors gates were open as he had try to break into other rooms as well before coming to our balcony. There was no security present. 3 police offers came and spent a long time with us. They explained that the hotel is responsible to guard their own property and that the Riu has not done to since they first opened over a year ago. They explained that the beach is guarded by a private company that the govt pays and the Riu doesn't feel they need to spend additional money, despite the fact that all the other hotels do. The next day we went to the front desk in an effort to speak with someone, and we've been quite a fixture there so everyone knew who we were, the PR woman looked at us and said 'Is there something I can help you with?' We laughed and said 'Stolen computer, man in the window?' and she said 'I'm sorry I have no recollection of what you are talking about'. Basically trying to pretend it didn't happen. We knew right then and there this was going to be a big problem. We asked for a copy of the hotel incident report for our insurance and she said no that's private. The police gave us copies of the Police report and said that the hotel is supposed ot supply their info to us as well, so we went behind her back. We made a buddy in security and he went into the security office and informed us that the hotel did not file an incident report and PR ordered him not to file one. However, we're too smart for that so we had the private beach security fromt he govt file incident reports on everything and supply us with copies. Not once did anyone in management at the hotel try to make the situation better, make us feel comfortable or just do the right thing. Our neighbors were robbed!! The thief came in through their locked windows. We weren't taking any chances so we got a wooden bar because the window was sliding and put it behind the window. But, is this what you should be concerned with on your very expensive vacation? I don't think so. My sister was so panic stricken that she was scared to be in the room alone ever and just wanted to go home. My parents were basically sleeping with their valuables and money in the bed with them. Aside from getting robbed...the hotel was terrible in other ways. For a new hotel the work is very shoddy, poorly painted and sheetrocked. Bathrooms have mold. The hot and cold pipes in our room were reversed leading to a first day scalding! Then the temperature regulator in the shower was broken which caused scalding in every subsequent shower. Thankfully we don't have little kids because that would have been a major problem! The room never felt clean. I was grossed out to walk around without my flip flops on. We have gotten ourselves an Aruban attorney to sue them there and we are also sueing their US Corp. Shockingly, theyre pretending none of this happened so far. Not the best idea, when it was printed in detail in the local newspaper the day before our departure which we of course have copies of. Also, the hotel has wireless internet for free in the lobby which is nice, but no business center in case you didn't bring a portable printer and need to print or fax something. Most hotels have a place where you can pay to do this...not them. Also, they're a closed (not open air) lobby and they allow smoking in there which is pretty unheard of nowadays, so you can't really take your kids in there. Oh and least but certainly not least. If you get towels and use them so they're wet - they won't exchange them for you. If it rains on your towel and you need new ones they say 'We aren't allowed to exchange soiled towels'. I have never in my life heard of this. They are just not service oriented at all. Take your money and go to the Marriott, Hyatt or one of the other better hotels!! We have gone to this property for nearly 10 years and never had a problem. This year we noticed numerous internet reports of robbery and theft at the Aruba RIU. We went with concerns and expressed them on arrival, which the hotel management blew off. On Xmas eve, our room was burgularized close to midnight as my wife slept in the bedroom! How creepy and scary. The robber took cash, electronics, jewerly and phones.The room below us reported a man coming in the window then the wife screamed and he darted out! The hotel management was nasty and denied any problems. Our safety and security was of no or very little concern. The police came and filed a report but showed little interest or worry for us. It was horrifying!! There is a serious safety issue at this property. If you want to feel secure and not worry when you sleep, stay elsewhere!!! If you want to eat well and have a big pool, stay here. 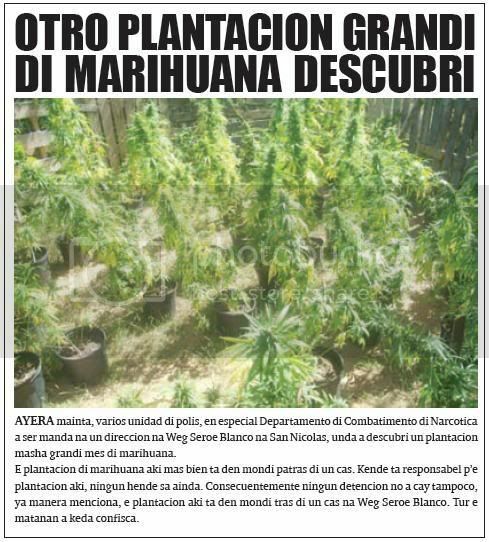 another plantacion big of marihuana descubri yesterday morning, several unidad of police, provided that especial departamento of combatimento of narcotica owing to being send at one direccion at weg seroe blanco at san nicolas, where owing to descubri one plantacion very big self of marihuana. the plantacion of marihuana here more bien is in forest behind one cas. that is responsible p’e plantacion here, none person know still. consecuentemente none detencion not owing to cay niether, already as menciona, the plantacion here is in forest behind one cas at weg seroe blanco. all the matanan owing to stay confisca. This article about an American tourist's death in Aruba raises a lot of questions in my opinion. From what I understand on the first of January, the man jumped from a first story hotel room and broke his arm. He was taken to the hospital for treatment, and nine days later he died. No mention of an autopsy, but states that the body was cremated. after of 9 day in hospital tourist owing to fayece. day 1 of january, one tourist mericano, for 11.40 of night, supuestamente bao of influencia of alcohol y also of drugs, owing to cay for of first floor of one hotel in centro of oranjestad y owing to fractura his arm. police y ambulance owing to arrive n’e sitio, y owing to transporta the tourist henry matthew charles, naci at estados unidos day 19 of july 1972, for poli for tratamento, already cu his arm owing to stay fractura. sinembargo, by of the caida, the have to owing to achieve golpinan more earnest, because; cu day 10 of january, police owing to achieve informacion cu after cu past owing to stay interna all the dianan ey in cuido intensivo, past owing to fayece, debi n’e golpinan cu past owing to achieve. dr. croes owing to constata dead. the curpa will wordo send corsow for creamacion. paz at his restonan. ORANJESTAD – Tin indicacion serio cu e atraconan riba turista ultimo temponan ta bin di un gang di hoben cu den pasado a comete tipo di atraconan aki caba. Esaki segun Alto Comisario di polis Peter de Witte na Bon Dia Aruba ayera. Esaki no ta kita afor cu nan ta haciendo todo por todo pa atrapa e grupo di hoben aki y asina trece pas bek na e area hotelero unda cu tabatin tur e problemanan ultimo tempo. A haci e pregunta na e Alto Comisario mirando e hecho cu den pasado tabatin un grupo di hoben tambe cu tabata comete e atraconan aki, creando e panico necesario. Y awor posiblemente tin un otro grupo di hoben cu tambe ta cometiendo e mesun actonan aki. Riba e asunto aki e Alto Comisario a mustra cu lamentablemente tin indicacion cu e biaha aki atrobe ta trata di un grupo di hoben cu ta cometiendo e atraconan aki den un forma structura. Di otro banda no ta asina cu tur turista cu yega Aruba, ta wordo atraca. Ta tambe e forma con bo ta anda y trata e situacion aki segun e hefe maximo di polis. Bo tin cu tene cuenta con bo ta conta e storia aki segun de Witte, pa e turista of persona no haya e impresion cu Aruba ta un isla insigur. „Nos por bisa segun mi, cu esei sigur no ta e caso aworaki” de Witte a sigura Bon Dia Aruba. Cada incidente cu un turista ta uno dimas. Polis ta sumamente alerta riba e asunto aki y ta realisa cu e seguridad den cuadro di turismo ta masha importante. Bo por inverti masha hopi placa den trece turista, pero si no tin sentido di siguransa, no mester papia cu atrae turista ta placa tira afo, pero bo lo nota cu bo ta perde tereno riba e asunto aki. Visibility Team ta traha hunto cu AHATA y ta funcionando bon aunke tin lugar pa mehoracion. Ta trahando hunto cu e seguridad di hotelnan cu ta e wowo di polis den casonan asina. Y ta purbando asina tambe pa logra haya financiamento pa por atende e asunto seriamente. Bek pa e gang di hoben, aña pasa tabatin un aumento di atraco riba turista. Esei a resulta enberdad di ta un asunto di un gang specifico, cu a wordo atrapa, enjuicia, y encarcela. Lamentablemente tin un grupo cu atrobe ta haciendo mescos. No ta descarta cu esaki lo ta posiblemente e mesun grupo pasobra e tempo cu nan a bai sera, tabata un tempo limita. can some choller is steal car of police diabierna night for 9.30, polisnan at keep in centro of husticia at santa cruz, is hear alarma of car of police bay, y is see one muher sit in one of the autonan. also police is see cu the car was bek. one police owing to fly window y owing to descend the muher for of the car. after owing to bay sit behind the stuur, for stop the car cu was bek. but all the time, the muher v.v. naci at aruba of 42 year owing to ranca careda y owing to core bay. another polisnan at keep owing to core his slow y owing to succeed detene. past owing to stay close. man detene at dakota cu drugs y enough coin police of oranjestad is achieve informacion cu near of dakota bar have 4 man owing to arrive, y cu they're dress cu camisa black y have indicacion cu they're arm. police owing to bay cu very cautela, y good prepara. was more or less 9.30, of night, cu fast dakota bar, at come across cu the 4 hobennan as describi, esta caminsa black y cu short. at once owing to place all esnan in becindario sleep plat, for listra they enbusca of arm of candela. have to tell cu hour cu police owing to arrive n’e sitio, they owing to constata cu the bar owing to close his portanan end. but if police owing to come across cu the 4 hobennan as the denunciante owing to tell. is deal of 4 young of cual 3 had short dress. police owing to listra they their curpa, after of owing to ponenan sleep abao, but not owing to achieve arm of candela. if t’asina cu on curpa of r.q, naci at aruba of 36 year, police owing to achieve one saco in cual had grass of marihuana. also the had one can of mention in cual had 7 package cu cocaina. also the had 325 guilder y 20 dollar. drugs y coin owing to stay confisca y r.q owing to wordo take away keep, where past stay close. 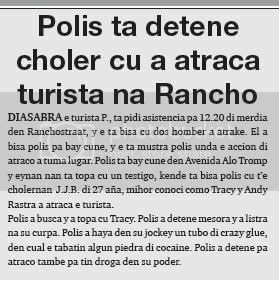 police is detene choler cu owing to atraca tourist at rancho saturday the tourist therefore., is ask asistencia for 12.20 of afternoon in ranchostraat, y the is tell cu two man owing to atrake. past owing to tell police for bay cune, y the is show police where the accion of atraco did take lugar. police is bay cune in avenida alo tromp y eynan they're come across cu one witness, that is tell police cu t’e cholernan j.j.b. of 27 year, mihor conoci because; tracy y andy rastra owing to atraca the tourist. police owing to busca y owing to come across cu tracy. police owing to detene at once y owing to listra at his curpa. police owing to achieve in his jockey one tubo of crazy glue, in cual the had some stone of cocaine. police owing to detene for atraco also for have drugs in his power. desconoci is happen y break windshield of two car cu stone presencia of police of san nicolas owing to wordo ask diabierna 4.15 madruga, at one cas in betonicastraat, where desconocirnan owing to break windshield y light of two car. the inhabitant of the cas is tell police cu they was sleep y past owing to hear one desorden y the cachonan was blaf. past owing to aali pafo y owing to see cu desconocirnan owing to break windshield of his car y esun of his child muher cu stone. also they owing to destrui the lusnan behind the autonan. police did take his complaint. Apparently someone had their purse snatched from poolside at the Renaissance Marina Hotel. Diabierna marduga un par di turista tabata relaha na pool deck di Renaissance Hotel. Na un dado momento nan a ripara cu tin un persona stranjo tabata den nan tas y a logra di bay cu algun cos for di e sitio. Ora cu e turistanan a mira bon nan por a ripara cu e persona en cuestion a bay cu placa y un camera. Polis a yega na e sitio pa asina wordo informa door di e miembrona di seguridad. Despues di a wordo informa Polis a bay tira bista den vecindario pa mira si nan por a topa cu e malechor aki. Nos por menciona cu e casonan aki di ladronica riba turista ultimo simanan ta lantando cabes enormemente. Tambe nos tin informacion cu na algun hotel hasta e mesun empleadonan ta hortando pertenencia di nan huespednan. Aki nan ta horta e articulo y purba di bendele pa haja placa. Den algun di e casonan aki nos por informa si cu tin varios arresto a tuma lugar. Esaki sigur ta algo di lamenta. 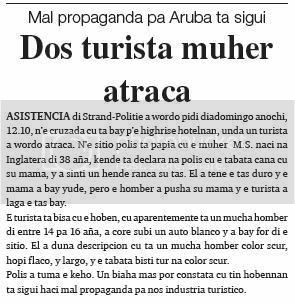 bad propaganda for aruba is follow two tourist muher atraca asistencia of strand-politie owing to wordo ask diadomingo night, 12.10, n’e cruzada cu is bay p’e highrise hotelnan, where one tourist owing to wordo atraca. n’e sitio police is talk cu the muher m.s. naci at inglatera of 38 year, that is declara at police cu the was march cu his mother, y owing to feel a ranca his bag. past owing to as the bag duro y the mother owing to bay yude, but he owing to push his mother y the tourist owing to let the bag bay. the tourist is tell cu the young, cu apparently is one boy of among 14 for 16 year, owing to core lever one car blanco y owing to bay for of the sitio. past owing to give descripcion cu is one boy color dark, much flaco, y largo, y the was dress all at color dark. police did take the complaint. once more can constata cu have hobennan is follow haci bad propaganda for we industry turistico. 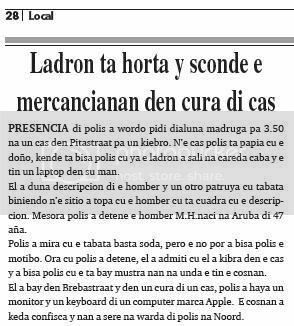 thief is steal y sconde the mercancianan in cura of cas presencia of police owing to wordo ask monday madruga for 3.50 at one cas in pitastraat for one kiebro. n’e cas police is talk cu the owner, that is tell police cu already the thief owing to leave at careda end y the have one laptop in his hand. past owing to give descripcion of he y one another patrol cu was biniendo n’e sitio owing to come across cu he cu is cuadra cu the descripcion. at once police owing to detene he m.h.naci at aruba of 47 year. police owing to see cu the was enough sweat, but the not can owing to tell police the motibo. hour cu police owing to detene, past owing to admiti cu past owing to break in the cas y owing to tell police cu the is bay show they at where the have the cosnan. past owing to bay in brebastraat y in one cura of one cas, police owing to achieve one monitor y one keyboard of one computer mark apple. the cosnan owing to stay confisca y they owing to sere at keep of police at north. First off, I know I'm really overdue in writing. We just moved out of state and really wasn't up for reviewing. Now for the 'skinny"
We went in early October 2008 to attend my husbands’ best friends wedding. Our room was not in the best shape (see pics) and it wasn’t ready… we were made to wait for a couple hours in the heat… our luggage was put in “storage” and we couldn’t get to our bathing suits. On our first night there, we went to dinner in one of the upscale restaurants (food was very good) on the Divi grounds and the waiter conspicuously was extending our time in the restaurant. Only a few of us noticed that he asked what room we were staying in (there is no need for that as we have the all-inclusive bracelets on.) When the bride to be's sister and brother-in-law got back to their room, they discovered that their room had been broken in to and their safe had been ripped off the wall and all their money and travel documents (yes, passport) were gone. They had one of the (nicer?) rooms on the second floor at the very end of the hotel. We were told that that happens “now and then”. Their trip (& the brides) was ruined. I was afraid to leave anything in our room and was nervous walking back to our room through the grounds which were dark and isolated in some areas. I wouldn’t have given that a thought if someone in our party wasn’t robbed. Then at obviously no fault of Divi's - the island that never gets rained, got rain every single day. The wedding got rained out for the day following the break-in. And the sister and brother-in-law had to go back home (after spending hours at the airport being sure they could get home without their passport. Luckily the day after that was good enough to have the wedding on the beach with just the 4 of us attending. Overall the hotel was OK. The restaurants plentiful and the beach absolutely the best, softest sand. Oh Yeah, after the heavy rains, the run-off from the street, tore a gash into the sand and it smelled like sewer for a couple hours. But the cloudy, rainy, stormy day kept you off the beach anyway. Would I go back? No, I don’t feel safe there. And they really didn’t get much from the hotel for their trouble of being ripped off and inconvenienced on a special trip such as this. Another American tourist incident....in their hotel room! more ladronisia of tourist in hotel patrol policial of north, diarazon 5.30 madruga, is bay at one highrise hotel, for one caso of ladronisia. n’e hotel, police is talk cu the tourist g.b. naci at estados unidos of 61 year, that is tell police cu the was sleep in bedroom y owing to feel the door of his bedroom strike. past owing to arise for see kico is pasando y owing to see one man more or less 1.75 high, t-shirt sleeve largo beige, jeans cu cabey cortico, cu pechi modern on his cabey, y aspecto latin, march bay. the tourist owing to dicidi of follow behind he y owing to march his slow till hour cu past owing to enter in lobby. while cu he was march the had telephone in one hand y cu the another hand, the was try open the portanan of bedroom. past owing to ask about he if the is perdi, past owing to contesta the tourist cu the is buscando one amigo. hour cu the tourist owing to arrive in lobby, behind he, past owing to come across cu one guardia y owing to count ; this kico owing to happen. past owing to tell cu the guardia owing to talk cu he in one language cu the do not compronde. the tourist, g.b. owing to tell the guardia for as he, while the is bay controla his bedroom. in his bedroom past owing to achieve miss of one bag brown, in cual had one camara digital y also some another cos more. past owing to bay bek close the guardia, y owing to see cu the guardia owing to let he bay y neither sikiera owing to ask about his name. police together cu some guardia owing to bay busca the bag y in forest they owing to achieve the bag throw, cu the another cosnan in dje, but without the camara. hour cu the tourist owing to angry, the guardia owing to become grocero contra the tourist y owing to puntre dicon the self not owing to detene he y owing to tell cu t’e self owing to throw the bag afo. oranjestad - diaranson morning recherche of beach is haci one detencion at ranchostraat 7 y also is take one vehiculo in beslag. they owing to succeed confisca cocaina y also marihuana y owing to detene one muhe. do not one secreto cu in ranchostraat have several minimarket cu is sell all type of drugs. but not can generalisa, already cu have several family cu live eyden cu is harta of all the bagamunderianan cu is sosode all day in the caya here. they not have as of sell they cas niether already cu niun person will wanted cumpra one cas in the sector there debi at the situation bleak here. recientemente police owing to throw one sospechoso, y do not more one secreto publico cu day y night bendemento of drugs is sosode in the caya here, y circulacion of choller at granel. will is good for autoridadnan follow throw inval on the casnan conoci because; minimarket of bendemento of drugs for so trece light in the district here cu owing to being afecta debi at the business ilegal of drugs. while cu visibility team is tell cu not have much crimen near of hotelnan three man is ranca bag of tourist once more one tourist italian cu is kedando at one highrise hotel, diarazon 9.30 of night, is bay at keep of strand-politie y is haci denuncia of ladronisia cu violencia. the is tell police cu the was canando, hour cu three man on mountainbike owing to happen near of ache, all three dress at black. the is tell cu one of the hombernan owing to ranca his bag black cu orange-coloured y owing to core bay. the is tell cu in the bag the had his visacard, key of bedroom y also his rijbewijs. 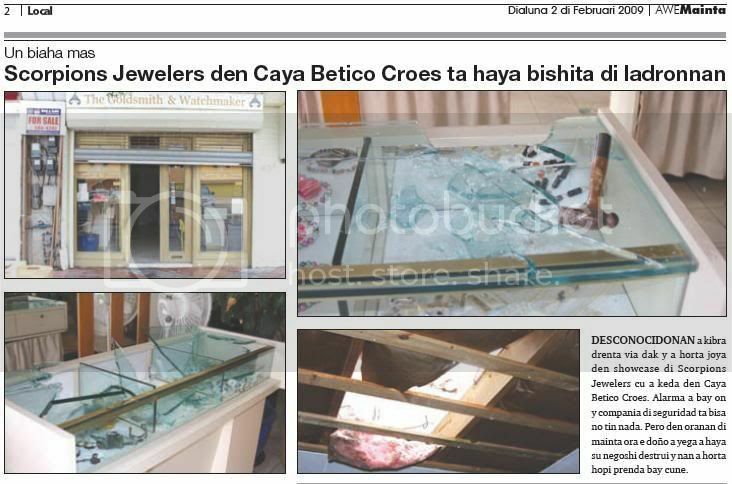 once more scorpions jewelers in caya betico croes is achieve visit of ladronnan desconocidonan owing to break enter via roof y owing to steal joya in showcase of scorpions jewelers cu owing to stay in caya betico croes. alarma owing to bay on y compania of seguridad is tell not have nothing. but in oranan of morning hour the owner owing to arrive owing to achieve his business destrui y they owing to steal much jewel bay cune. 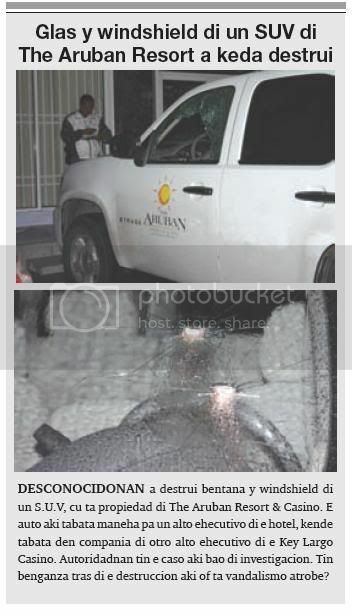 glass y windshield of one suv of the aruban resort owing to stay destrui desconocidonan owing to destrui window y windshield of one s.u.v, cu is property of the aruban resort & casino. the car here was maneha for one alto ehecutivo of the hotel, that was in compania of another alto ehecutivo of the key largo casino. autoridadnan have the caso here bao of investigacion. have benganza behind the destruccion here or is vandalismo again? ORANGE CITY - A 26-year-old from Iran coming tourist MS had to be transported to the hospital after a drug in her drink had done. Last Saturday chaired the bather a drink tequilla when an unknown man in her came to a chat. After a while, felt S. are unwell. When the police arrived the victim had been taken to hospital for treatment of her complaints. The next day S. together with her husband to the police in order to make a statement. The matter is further investigated. What did this poor man do to deserve such humiliation? ordo & prosperidad owing to stay at where?? 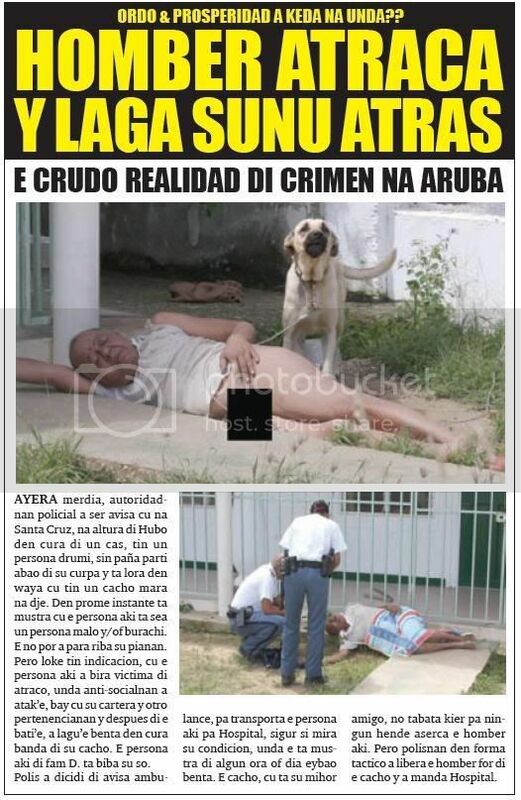 man atraca y let sunu behind the crudo realidad of crimen at aruba yesterday afternoon, autoridadnan policial owing to being avisa cu at santa cruz, at height of hubo in cura of one cas, have one person sleep, without cloths part abao of his curpa y is lora in wire cu have one cacho mara at dje. in first instant is show cu the person here is as one person bad y/of sober. the not can owing to stop on his pianan. but thing have indicacion, cu the person here owing to become victima of atraco, where anti-socialnan owing to atak’e, bay cu his cartera y another pertenencianan y after of the bati’e, owing to lagu’e throw in cura near of his cacho. the person here of surname d. live his only. police owing to dicidi of avisa ambulance, for transporta the person here for hospital, assure if see his condicion, where the is show of some hour or day eybao throw. the cacho, cu is his mihor amigo, not was wanted for none person aserca he here. but polisnan in form tactico owing to libera he for of the cacho y owing to send hospital. Page created in 5.336 seconds with 20 queries.